Authors must make certain decisions when constructing a graph to represent the results of their study. Consider Figures 2 and 3 below. Both figures use the exact same data set to describe an experiment with two independent variables: gender and exercise. Notice, however, that each figure stresses different parts of the experiment. EXAMPLE 2. Interpreting Figures 2 and 3. Based on Fig 2 or 3, does exercise affect heart rate? Based on Fig 2 or 3, is there a gender difference in heart rate? 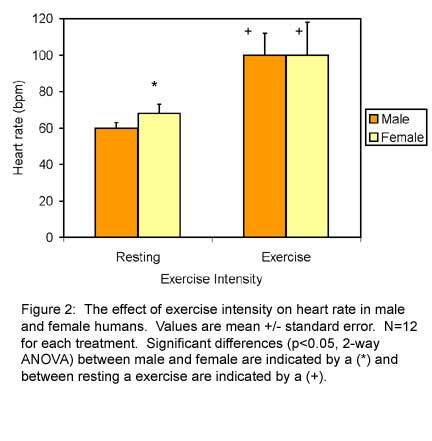 Based on Fig 2 or 3, does exercise influence the difference in heart rates between males and females? Which figure is more effective at stressing a difference in heart rate between males and females? Which figure is more effective at establishing a difference between exercise and resting? Yes, females tend to have higher heart rates at rest than males. Yes. In the resting condition, females have a higher heart rate than men. However, after exercise, the heart rates of males and females do not differ. Figure 2 shows these differences most clearly because it directly compares the heart rates of males and females based on exercise type. Because heart rates at rest and heart rates during exercise vary greatly, both figures effectively establish a difference. 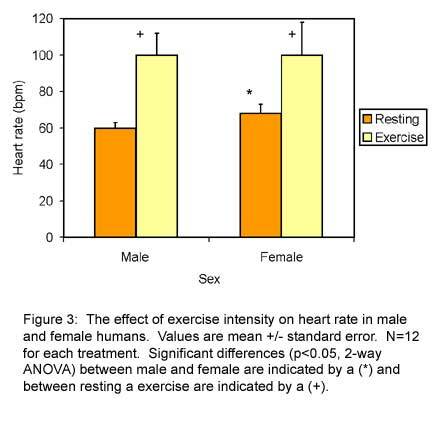 The magnitude of the difference in exercising and resting heart rates for each gender can be most easily viewed in Figure 3.